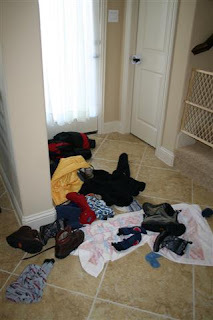 We have spoken recently about trouble with 3 year old boys, and mine is giving me fits! This morning I was on my own (with five kids) for Mass, and my little boy made me so angry that I, well, got angry. Getting angry in church gives me a feeling of frustration and guilt which sometimes makes me even more angry, either at the child or, for some reason, at the Church, God or the Priest. This is usually followed by an internal debate about whether or not, being this angry at a baby for not staying still, the priest for giving a homily or God for asking me to attend church makes me unprepared to receive the Eucharist. This morning, however, something different happened. When I took the noisy child to the vestibule, I looked him right in the eye and said "we are offering this hour to God, however imperfectly." Speaking these words, I internalized them, and I remembered that the imperfection of his behavior and the imperfection in my heart were both, to my Lord, childish imperfections. Only Christ is the perfect sacrifice, and His sacrifice perfects ours. I think of it like this: my children are learning to make their beds. They straighten the sheets and pull up the blankets, but the bed is still a wrinkly mess. I appreciate their efforts and I take time to smooth the covers, so that the bed is well made. I know that they will keep working at it, that they will have good days and bad days, and that if I expect them to do a "grown up" job I am being too hard on them. I do, however, expect them to try. God is a strict but loving parent, I know that He wants me to do the best I can to prepare for the Eucharistic sacrifice, but that he is also expecting to have to smooth out a few wrinkles in my soul before it is ready to receive the body of Christ. I just walked though the kitchen to find my dark chocolate bunny ears missing. You know, the ones I was nibbling on so as to savor the treat for more than 5 seconds. Since both boys were napping I looked incredulously at Mr. Incredible, "Did you take my chocolate bunny ears?!?!" His response: "What, is it a rule you can't take a pregnant woman's chocolate?" Ummm...YES!!! IT IS A RULE!!! In other food-related Easter news, I prepared Easter baskets, bought egg dye, etc. well before Easter knowing that we would be traveling right before Easter. I failed to remember (in my coconut-oil induced health conscious haze) that the organic free-range eggs that I feed my family are brown. This is not ideal for egg dying. But we have 50 joyful days to celebrate the Resurrection, so plenty of time to find some white eggs. And one last thing...if you are pregnant and gave up sweets for Lent and your baby in utero lets you know that he needs some refined sugar and high fructose corn syrup on Easter Sunday, be sure you have Tums on hand. Just trust me on this one. I couldn't resist sharing these Easter photos of my little ones :) It's hard to believe that an entire week has passed since Easter Sunday. A blessed Divine Mercy Sunday to all of you! In light of some recent comments that have been made, I just wanted to send out a friendly reminder that, as stated in our opening post, "It is our hope that this blog will serve as a source of encouragement for all who read it..." Please remember that we are trying to encourage each other; perhaps we should all remember the old saying, "if you don't have anything nice to say, then don't say anything at all." This does not mean that we cannot disagree with one another; rather, it means that we should steer clear of disparaging or mean-spirited remarks. If you really need to get something off of your chest, please feel free to email any of the builders of this blog personally. Thanks for all of the discussion so far - keep it up! I do not feel that my parish is very encouraging or supportive of mothers who choose to stay at home with their children. My pastor is not fond of small children and regularly encourages parents to leave their little children at the parish-provided baby-sitting service (not children's liturgy, just baby-sitting) such that the children never even enter the church. Almost any meeting or event is on weekday evenings which is very difficult for me to attend as I nurse a 4-month-old who is always more needy at the end of the day and I have a 2-year-old whose bedtime routine it would mess up quite a bit, not to mention it is the primary time of day I get to spend with my husband. I think the times are generally chosen for adults who work during the day, but I feel like there is no way for me to be involved with my parish outside of Mass. 1. Does anyone else feel this way or is it just me? Maybe it is just my parish and not a common thing. 2. If someone does not feel this way, is there something your parish does so that you don't feel this way? I'm wondering if my parish is more in the minority or the majority and I'm also wondering what can be done such that ministry to women like me doesn't fall through the cracks." First of all, let me extend a warm hug of support and pat on the back for seeking out Christ in your day-to-day and desiring to commune with your parish outside of Mass on Sunday. When done right, a parish community can nurture a variety of ministries to the sick, poor, young, and old, bringing glory and honor during the week to the Eucharistic celebration on Sundays. I can remember GG and I attempting during our first year in Colorado to join a Bible study that met on Tuesday evenings (we didn't have kids yet). We found ourselves among four elderly couples, who were the sweetest people on earth and so nurturing to us. We had prayed for fellowship in our new parish and received a bountiful answer, just not in the form we expected! Secondly, it sounds like you might have to be a pioneer within the parish in order to bring about ministries catering to mothers and young families. Perhaps there is another young mother you know who can help you spearhead a playgroup or a mother's Rosary group that meets while the kids play? I would challenge you to find like-hearted women and meet with your priest to explore options for you in the parish. 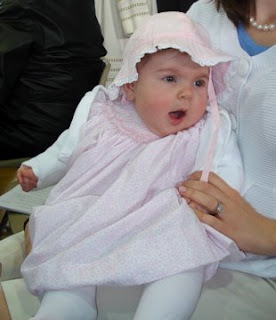 Other parish ministries I've seen for mothers at our previous parishes include a Mom's Catholic group (brunch and ministry while childcare was provided--started in CO by a few moms with similar desires to yours; it was an awesome group--I just had to have a baby and find it! ), Parents' groups that meet in the a.m. (similar in structure) , parish picnics at family-friendly times, and the Elizabeth ministries (providing support for mothers during childbearing years--meals, meetings, etc.) We've recently found a wonderful parish here in Indiana that aims to nurture the entire family, while exalting Christ in His Sacred Mass. It is beautiful to witness and is very possible with the commitment of parishioners to aid the priest(s) in such a mission! "Parish ambassadors" sit down with new families/parishioners and inform them of all the ministries available to them. I think this is a wonderful way of bringing His sheep into the fold of a church... We've also seen churches offer a ministry fair (usually in September) with tables representing the various outreaches of the church. Are Catholic Churches perfect? Absolutely not. Can we help to make them better? Of course! Blessings to you, Katherine, as you pioneer for your Church! God speed. Here's a great idea for a toddler service project. Check out this video. Make sure you turn the volume up first, it is very moving. Then click here, for more details. Texas Mommy just posted this in a comment, and it's something I've been thinking about lately as well, so I'm taking the liberty to initiate a full post on the topic... what do you do to get very young children involved in acts of charity in the community? We don't have much extra stuff right now because of our limited living space, so we don't donate much. This is horrible, but I was deterred from nursing home visits by constant inquiries from a former pediatrician about whether my baby had been in contact with elderly in nursing homes, because apparently tuberculosis is widespread in nursing homes? Is this a serious problem? And anything that requires my children to focus and do something like sort cans seems to require more effort than it's worth. So while "acts of charity" is on our list as one of several morning activity options, our most frequent acts of charity are offering to watch a friend's children or cooking/baking for someone who needs help or cheer. This counts, and 3-year-old Bella definitely understands the value of it, and maybe it's all a mom can really hope to accomplish with young kids... but if anyone has other suggestions, please fire away! 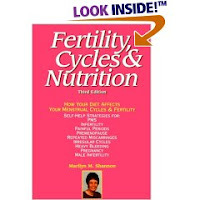 In my brief 29 years of experience, Fertility, Cycles and Nutrition by Marilyn Shannon is the best book I have come across on nutrition for the layperson. In the book, Shannon discusses the link between diet and fertility, AND encourages some basic dietary changes for women and men. I read this book as a newlywed, and I can honestly say that it changed my life. Her book had a huge impact on my diet, my female cycles, and our ability to conceive our children. My husband and I now teach Natural Family Planning classes, and I heartily recommend her book to our students and anyone else who will listen. And if my own personal testimony isn't enough for you, Drs. Jorge Chavarro and Walter Willet of the Harvard School of Public Health have confirmed much of what Shannon originally argued 15 -20 years ago. In their new book, The Fertility Diet, Chavarro and Walter compile information from the Nurses Health Study, and make dietary suggestions very similar to what Shannon argued for in her own book many years ago. In the ongoing Nurses Health Study, started in 1989, thousands of nurses kept records of their diet, exercise, and other life patterns. Chavarro and Walter studied the data from participating nurses who wished to become pregnant. The data showed several correlations between diet and ovulatory infertility. In the latest issue of Family Foundations Magazine (put out by the Couple to Couple League, the largest provider of NFP services in the US), Shannon very humbly summarizes this new book and highlights some of Chavarro and Walter's recommendations. 1. Avoid trans fats. The artery clogging fats found in many commercially prepared products and fast foods. 3. Eat more vegetables protein, like beans and nuts, and less animal protein. 5. Drink a glass of whole milk or have a small dish of ice cream or full-fat yogurt every day; temporarily trade in skim milk and low or no-fat dairy products like cottage cheese and frozen yogurt for their full-fat cousins. 8. Beverages matter. Water is great; coffee, tea, and alcohol are okay in moderation; leave sugared sodas unopened. 9. Aim for a healthy weight. 10. If you aren't physically active, start a daily exercise plan. I find many of these recommendations a matter of common sense, but others are really interesting, particularly the go ahead for full-fat dairy products. The low-fat craze is most evident in dairy products, but natural fat as found in milk is actually very healthy. Our family traded in skim milk for full fat dairy years ago (and believe me this was difficult for me as I actually like the taste of skim milk better!). Plus full fat dairy products are really great for kids and their developing brains. Ultimately, why is this so important? First of all, many painful infertility treatments can be avoided through dietary and lifestyle changes. But in a broader sense, our fertility is just another sign of our overall health. If a women has irregular cycles that can be aided through dietary changes, well then think of all the other things that might not have been working so well in her body. So the recommendations of this study are really good for everyone, even those not currently trying to add another little one to their family. The house we are moving to this summer has a pool, and we have been educating ourselves on the importance of pool fences to protect our children from the drowning dangers pools pose. Alas, no fence exists to protect us from peril confronting us at the moment: We are drowning in stuff. Beginning before Halloween and ending at Easter, our relatives have fallen victim to society’s exhortations to buy stuff for our kids. In October, the stuff was candy (junk for the body). In November, the stuff was stickers, thingamabobs and whatchamacalits related to Thanksgiving (junk for the mind). In December, the stuff was Christmas presents (junk for the soul). In January, the stuff was STILL Christmas presents, this time from people we did not see over the holidays (junk for the already-junked soul). In February, the stuff was a mix of Valentine’s Day candy and stickers. In March, the stuff was the double-whammy of St. Patrick’s Day doohickeys and Easter (what else?) candy. You’ve heard the expression “Up the river without a paddle”? Well, we don’t even have a boat. The torrent of stuff washes over us and threatens the stability of our day-to-day existence. It is so hard to get our children to eat nourishing food when jelly beans are sitting in an Easter basket in the next room. It is so hard to find worthwhile uses of our family’s time when plastic toys demand our children’s attention and crush their spirits when they break, often on first use. On the one hand, we feel guilty and ungrateful for reacting this way to our relatives’ kindness. But we didn’t ask them for the stuff, and, really, it’s not their fault anyway. Americans can’t go out to stores without being pummelled by the urge to buy something -- anything! -- that they didn’t have (and didn’t know that they even wanted) before they saw it, sitting there, marked with a sticker that says “70% off”. Who can blame anyone for wanting to buy something for 30% of its value? Of course, its “value” must not be the number that you’re paying 30% of, because otherwise it would have sold at that price and wouldn’t be marked down at “70% off”. What’s more, the people whom the government has decided have enough disposable income to spend on stuff aren’t getting the money; instead, it is going to the people who don’t make enough to have disposable income and whose buying of stuff without having the money to pay for it helped get us all into the mess in the first place. And when we say the “government” is going to send us all money, what I mean is: Our elected officials have decided that it is a good idea to redirect tax receipts from those who make too much to qualify for its largesse and to give the money to the other people, so they can spend money like the people who make too much to qualify for the government’s largesse. Back to our four walls. We are raising five little people who, in the blink of an eye, will work to earn bread for themselves and their families, and they will have to make choices about how to spend their money. We may make enough for the government to decide that we have enough disposable income, but we don’t make enough to afford to let our children learn bad lessons now. Society is trying to teach them that stuff can make them happy, that buying something -- anything! -- can make a bad day good. Sending them out into the world having learned such lessons would be tantamount to our eschewing a pool fence and taking our chances that they won’t be tempted to creep to the edge of the pool when the weather gets warm. We need to be rescued. No less than if we were drowning in a backyard pool. If, like me, you are often found to be a day late and a dollar short then perhaps tomorrow you will listen to a free download from Catholic World Mission. The Glory Stories are wonderful, and their entire Stations of the Cross/The Passion for Children can be heard online. My parish had a special day of Reconciliation on Monday, but I didn't make it to confession then. Today God has put it on my heart that there is still time to make the effort and receive the grace, to be reconciled with my Father in Heaven before this most sacred Feast. My kids are sick, and we will not be attending any of the Easter Triduum services, but my parish does have several times available for Confession over the next few days and I am determined to get there. I pray that the line is long, it will mean that other souls are seeking this sacrament. Elizabeth Foss pointed out this great Guide to Confession which I will use to prepare, my mom-brain needs all the help it can get these days. I have also been thinking of small things that I can do, on my own and with my family, to celebrate this sacred time. Perhaps a visit to the Church tomorrow, outside of the formal service. Perhaps tomorrow we will observe some period of silence, or try to stay quiet, generally. This week we have had very simple meals which has, I have found, allowed for more family time, some of which has been spent reading this book and this one. Please say a prayer for me this weekend, as I will pray for all of our readers and families to be drawn closer to the light of Christ into which we have been baptised. While most of us know this to be true, it is nice to see some secular sources finally acknowledging that abortion is not always in the best interests of women. Of course women are depressed when they have an abortion. Why? Because the interest of mother and baby are always intertwined--contrary to the professions of the pro-choice movement. It's just the way God made us! In my senior thesis at Princeton I focused on the negative psychological impact of abortion on women, highlighting the high rates of depression and "post-abortion" syndrome after the abortion procedure. It was difficult to find mainstream sources acknowledging this link, so this article in the London Times is a pioneer of sorts. The article also touches upon the very important issue of informed consent. And this is just the tip of the iceberg. Concern for womens health demands that women are informed of the increase risk of depression after abortion. It also demands that women are informed of other risks--like breast cancer. But in the US, these studies are either not performed, or performed and not published because it isn't politically correct to claim that abortion causes any problems for women. After all, abortion was legalized to promote woman's rights and if it isn't good for women, why should it be legal? In the spirit of Holy Week, my hubby and I found this video wonderfully inspiring! Enjoy and blessings to you! *Quick note: The link has changed and takes you, instead, to the Catholics Come Home homepage. Scroll down to the bottom and choose the "Epic" movie. That's the one to which we are referring! Enjoy! I don't know about the rest of you, but I'm personally battling some crazy three-year-old behavior these days! Never did I realize the "terrible twos" would turn into something worse; something for which this mama was not prepared. Looking back, I (lovingly) blame my mother for my gross unpreparedness. She would often comment that of our youth, her favorite age was "3". She would describe our emerging personalities and how fun it was to interact with us as little people and hear the funny expressions coming from our mouths. I'll agree with her on a certain level--M's (our oldest) verbal skills have done a 180 in the last couple months. Being a later talker, he now expresses himself freely (part of the problem) and has some pretty entertaining things to say. Just the other day we were chuckling at his comments about wanting to see the circus--"elephants and clowns and ducks" (ducks?) Not sure where that last one came from, but funny anyway! I also love how affectionate he's become in his 3-year-old ways. He is quick to offer his mommy hugs and kisses and can be quite loving, which is unusual for this independent kiddo. All that aside, I'm dealing with many of his 3-year-old extremes. Whines are prevalent as are "NO! "s in response to our requests. We are also dealing with extreme obstinance when we offer a "no" to one of his requests. Add to all of this his extreme sensitivity--he bursts into tears at the slightest hint of anger. Oh Lord, help! I need advice. I need wisdom. I need anything. Please! I would love any suggestions and encouragement! Please tell me this is a phase and that I just have a very strong-willed, passionate three-year-old?! Blessings to you. A blessed Solemnity of St. Joseph to all! I went to confession yesterday. Among many other things, I confessed to bickering--and yes even fighting--with my wonderful husband. The Priest asked me, "Why do you fight with your husband?" My answer, "Because God gave me red hair." He seemed mildly amused, but then we moved on to more serious topics. I received some great advice and a very interesting Penance. When it comes to your husband, say little, overlook much. When it comes to your children, say much, overlook nothing. Back when I was pregnant with twins, I read a LaLeche League ( I know, I know, Juris Mater, take a deep breath) book called Mothering Multiples. One of the very helpful things that I learned from this book was that only you can breastfeed your child. Since breastfeeding takes time and energy, it can be helpful to look honestly at the tasks of each day and think about whether some of them can be done by someone else so that you will be able to breastfeed. To this end, I have charged my husband with making breakfast and engaged a cleaning lady twice a month. I worked hard in the months before the baby was born to train the children in some small, helpful chores. Recently, however, I realized that I needed more help and so I have invited some celebrities to come in and give me a hand with my read alouds. This help is free and available to everyone in the form of Audio Books from the public library and we have been having so much fun. When I am tired, Stockard Channing reads Beverly Cleary and makes a pleasant dinner companion for me and the children, and I have become more sympathetic to my six year old as I have listened to Ramona's antics. I love my kids, and I love to read to them, but I just need to slack on something for a while, and this is helping substantially. At the end of the day, when I can only fit in one or two picture books before collapsing into my own bed, I sleep more easily knowing that my children have had plenty of books read to them that day by others. I have often wished that I could clone myself, and having Neil Patrick Harris read James and the Giant Peach while I drive the car or knowing that my Ipod is playing Tikki Tikki Tembo while I teach math lessons in another room does the trick. By the time you all read this, our family will be well on our way to knowing more about our precious baby #3 via our midway ultrasound (happening tomorrow morning!) Praise God for the blessing of technology to give mothers and fathers like us such wonderful information! My personal fears of spina bifida and anencephaly will hopefully be put to rest. Our desire to be able to call our child by name will be (hopefully) fulfilled. As I sit here thinking about it all, I begin to wonder—what would we do if we actually had to wait the 40 weeks before finding out the gender of our children? I say this, of course, tongue-in-cheek knowing that I am one of many spoiled parents privy to 21st-century technology. It’s often scary to realize what modern medicine offers the greater world. With information gained through amniocenteses and alpha-fetoprotein testing, women daily are choosing to end the lives of their precious children. Are we feeding people too much? Giving them a chance to play the role of God with information beyond what they should know? Thought-provoking questions, indeed. Yet I admit my husband, GG, and I still revel in the 20-week ultrasound. It gives us a chance to meet our babies visually, find out their gender, and call them by name. Greater information helps us feel closer to our children, more bound through the second half of the pregnancy and able to experience parenthood before the actual task begins. We realize that time with our little ones is not our own; every moment is a treasure. Today I will learn if my growing family will still be male-dominated (4 vs. 1 and a male dog!) or if I will be joined by a precious daughter (to help me battle the raging testosterone!) Today will mark a new beginning for our family and dictate how the coming years will ensue. Will we continue to be overrun by trains and cars, the color blue and balls of every sort? Or will our lives take a turn toward pink, toward sensitivity (!) and all things girly? Perhaps the outcome of today will simply mean another life will be added to our family, enriching our family’s proverbial quilt with new colors and personality. Whatever the gender, whatever the outcome, I am for certain that in all things with our Lord, He will work it for the good. In the spirit of Red’s post, we are thrilled to be welcoming another precious soul into the world, offering our children another chance to be siblings and to love without regard to self. Information-laden or not, we know we will be very blessed. The other day was particularly busy, and as I attempted to throw something together for dinner, baby Gus started to cry. As I rushed to wash my hands and hold him he suddenly stopped. I looked in the other room and saw Gianna sitting with him on the sofa. She sang to him, rubbed his little head and put the pacifier into his mouth. "You are so cute because you are little," she said. "Don't cry baby Augustine," she said in a loving voice. And he didn't. He not only stopped crying, he started smiling at his big sister. She looked up at me with pride, "I am taking care of baby Gus." Yes you are, I thought. There are some days when I am tempted to feel guilty about how I am NOT spending the day studying Augustine's every wrinkle and fat roll. But not this day. Today I am reminded that while time is passing, and he is growing and changing, I am giving him a family. He has all of OUR love and for that he is one lucky little boy. While the Feast of St. Patrick (March 17) is suppressed this year because it falls during Holy Week (unless you live in a diocese where St. Patrick is the patron...then it's moved to March 14), I have grown up celebrating St. Patrick's Day and simply can't make it through the month of March without corned beef and lots of green. Going to a Catholic grade school growing up, we were allowed the very rare opportunity to forgo our uniforms and wear green on St. Patrick's Day. There is nothing better than telling an 8 year old she can wear jeans and a green t-shirt to school instead of her uniform. Hence, St. Patrick has always held a special place in my heart! Sometimes I get over eager to share about all the saints with my 2.5 year old. The truth is, he is not quite ready to learn about each and every saint in the Church calendar. So I have found it more satisfying to spend several weeks talking about a particular saint and spreading out activities that make virtues or history more concrete. So we have already had a week of stories and talking about St. Patrick and more is on the way. 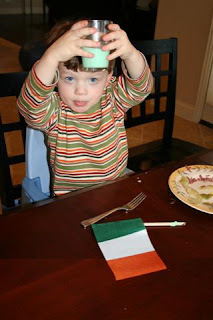 So far, Dash really loves that Patrick taught about the Father, Son and Holy Spirit using the shamrock leaves. We will bring in the image of the rainbow this week. We have several books on St. Patrick. Pingry's book prompted us to look up some Irish jig music and have a rousing Irish dance. We made salt dough shamrocks and painted them green. As always, catholicculture.org has great historical and activity info. We tried to bake shamrock cupcakes but they didn't really come out since we made a rich, homemade cake. I think you needed the spongy consistency of boxed cake mix for the shapes to work. The 4 Real Learning forum has lots of ideas if you search under St. Patrick. I'd love to hear if you all have any ideas or traditions for celebrating and teaching about St. Patrick! I could put this in the comments under MaryAlice's recent post on Going Green, but I thought it was interesting enough to get its own post. I saw this disturbing story today, and am really concerned about our water supply! Several years ago I read an article in Family Foundations Magazine about birth control hormones in our local lakes and streams. These hormones were causing changes in fish, specifically the male fish. Big surprise, now these hormones and pharmaceutical drugs are in our water supply. What we flush down the toilet gets filtered and cleaned, but trace amounts of the drugs we consume, from ibuprofen to birth control pills, eventually wind up coming back through our faucets. The water treatment plants are not high tech enough to remove many of the hormones and drugs from the water, so trace amounts remain. Over the past five years, the number of U.S. prescriptions rose 12 percent to a record 3.7 billion, while nonprescription drug purchases held steady around 3.3 billion, according to IMS Health and The Nielsen Co.
Makes me think twice about popping an ibuprofen for a headache, or taking that unnecessary antibiotic just in case the illness is bacterial. Last year my sister-in-law spent $6,000 on a reverse osmosis system for her house. I thought she was nuts as they don't have a lot of extra cash to spend and intensely purified water seemed a pretty low priority on my personal list of home improvement projects. Now she doesn't seem so crazy. I've heard that if you compost and recycle properly, the average American family would only have one bag of trash a week. 1) I've adopted the phrase "First things first" when talking with C, a phrase that my mother LOVED to use with us when trying to drive home the point that before you could get to the "fun" activities, you had to go through the more routine, practical activities. For example, before we were allowed to watch a TV show or go to a friend's house, we had to finish all of our homework...She also used this phrase to remind us of the order of importance of different activities - i.e. Going to mass on Sunday took precedence over getting to a birthday party on time, Getting our work done took precedence over talking on the phone, etc. So, here's to all of those phrases that we swore we'd never say, and now find ourselves saying :) Do you have any to share with us? Since we are chatting about finances, and I mentioned that I find it very educational and empowering to have some money that is my own to spend, I am planning to do the same for the children. I had noticed that they lose pencils, break crayons, etc, with little thought to any consequences. If they were in school outside of the home, there might be more natural consequences, but borrowing a pencil from Mom always seems like an easy option for them. To that end, I have decided to make a "school store." The first purchase was made by Merry, who replaced her crayolas at a cost of $3 (the same price I paid at Staples). When I saw the new crayolas scattered all over the floor, I gently reminded her that she had purchased them and they were quickly and happily cleaned up. Since then, the crayons have stayed neatly in the box. It was interesting, because Merry was happy to pay for new crayons whereas PT searched high and low for his pencil rather than part with a quarter. Merry is also really bothered by messy water colors. I can well imagine her choosing to purchase her own, and keep them seperate from the rest, rather than continuing to share with three year old artists. PT is ready for a new baseball glove, and we are going to ask him to pay for it himself, there is no occasion for a gift at the moment. For now, this money is coming out of piggy banks stocked by birthday dollars, but next year I plan to lay in a bunch of supplies and give each child a small cash budget for the school year. Thinking about winter realities, perhaps extra mittens will also be available in the school store as well as, periodically, special treats, books, etc. I have heard that some families operate a Christmas store, if the school store is going well then I may also add that. As with my own spending budget, one of the small goals of this financial freedom and responsibility is to make gifts more appreciated. When we have the sense that all of our needs are being met by some magical force (dad's credit card), it is easy to become spoiled. However, when we start to have a better understanding of how the world really works then that reward pencil from the dentist becomes much more attractive. Any thoughts on what worked well from your own childhood? For those who commented on being good at budgeting, what practical tips do you have for us to encourage this in our children? Thoughts on allowance generally? Responsibility about their things, activities, etc? I know I took my husband's law school classes much more seriously because I was paying for them! Recently, the hot topic around our house has been our family's budget! We're nearing the end of a two-year stint without any income, and while business school has been a great experience, I think we can all agree that it's about time for it to be over so that we can begin life in the "real world" again :) As we look at our projected budget for next year, we seem to come back to the same questions over and over again...With just about no "wiggle room" in our budget after the necessities are taken care of, what are our priorities and what are we willing to sacrifice? Every family's answer to this question will be different, so of course there are no right or wrong answers here, and that's almost what makes it more difficult! One of our biggest expenses will be our monthly mortgage payment, so we need to decide what trade-offs we're willing to make in terms of our living situation, and that decision will impact how much flexibility we have in other areas - schooling options for C (only a year away from kindergarten! ), travel, gifts, dates, etc. All of these are not necessities, but how will we feel if they're just not a part of our budget for a few years? I know that all of you moms deal with the same issues for your families...What process do you and your hubbies use for sorting through priorities and making those tough decisions? Again, I know that everyone's "final list" of priorities will be different, but I think we can help each other out when it comes to the process that we use in prioritizing. What are your thoughts? One final thought on budgets: One of the reasons that I love having a budget the most is that it actually gives us more freedom, because if we stay within the limits of what we have allotted for each category, we know that we are doing just fine. So, if we have allotted money for dates, then I don't feel guilty about spending that money - the same goes for things like family outings, haircuts, etc. This doesn't mean that we don't try to save money where we can, but it gives us the freedom to spend the money that we have allotted because we know that we have put a lot of thought (and hopefully prayer!) into constructing our family's budget. While I agree with most of what Professor George wrote, I've been a bit cynical these days regarding how much a politician can positively affect these sorts of life policies. Cynicism aside, George makes some great points as to the potential negative effect of electing a truly anti-life politician. Enjoy the read. Just a note to let all you snowbound northerners know that you are incredible! I don't know how you do it!! We had our once-every-5-years snowfall in Texas last night. Before 8am we had built a snowman. By 10am it had melted. By noon, the snow was gone and now it is in the mid-50's. Currently, the house is a mess with unmatched gloves, boots and hats laying everywhere. I am exhausted! I don't know how you ladies keep track of these foreign objects like "coats" and "hats" on a daily basis! My style always has been a neat, frequently-checked, carefully-maintained to-do list on a notepad sitting alone on a relatively tidy desk. Now that same notepad seems to scream to 3 year old Bella "take out that glittery colored pen from the desk drawer and graffiti me beyond recognition" and to 18 month old Bean "rip me into bite-sized pieces and consume me." So, while we're on the topic of home organization, how in the world do you keep your to-do lists safe from artsy and/or hungry toddlers? Have you scrapped to-do lists altogether and come up with a better and less vulnerable system for managing your day-to-day checklists? I've considered a dry-erase board mounted on the wall above my desk, but I'm afraid that will only encourage the kids to make their own "to-do lists" on other parts of the wall that will be none too easy to erase. I asked my husband what I should post about, and he said, "Isn't this supposed to be a Catholic blog? Maybe you should write about something besides food." I calmly explained to him that eating is a sacred participation in God's creative order. He just shook his head and walked away. 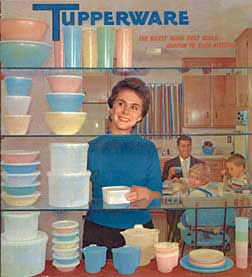 Now that that's settled, let's talk about Tupperware! When we got married, I registered for nice tupperware. Almost immediately, lids started disappearing and soon I was left with very few usable containers, not to mention nothing seemed the right size for my leftovers. Why do they give you so many really small containers anyway? If there is THAT little left, I prefer to just throw it away. For several years we never seemed to have the proper tupperware to fit our leftovers yet we lived with this situation as I was too lazy, and we were too broke to go spending money on more tupperware. I then went through a phase where I bought all "disposable tupperware," you know, the cheap glad and ziplock variety. You can use this stuff quite a few times before it cracks or needs to be replaced. This is the current state of things in our household. At present I have too much cheap tupperware, most of the lids don't fit with the tops--it was a big mistake to buy both glad and ziplock variety--and our tupperware drawer, or drawers are overflowing and disorganized. I dread unloading the dishwasher and having to put tupperware away. I dread having to put leftovers in the fridge and I regularly pull out a container, fill it with food, and I am then unable to find a lid that matches. There has to be a better way, have any of you found it?